After its success last year, POP vs JOCK is back. At 6’4” and a half, Win Butler, lead singer of the Arcade Fire, is an imposing presence on stage, but on the court, he might be a little on the short side. As part of the POP Montreal festival, a rag-tag team of musicians and celebrities, led by Butler, is going up against a team of Concordia and McGill athletes for a charity basketball game this Saturday. The event is called POP vs. Jock and it’s the second year the Montreal basketball and music communities have come together under the POP banner to raise money for DJ Sports Club, a non-profit youth organization in Little Burgundy. The game is taking place at McGill University’s Sports Centre and will feature a halftime show by David Byrne, of Talking Heads fame, and new media studio Moment Factory. Kid Koala and Butler’s fellow Arcade Fire member (and wife) Régine Chassagne will be providing music during the event. Some of the POP players up against the Redmen and Stingers are Win and his brother Will Butler, Martin Starr of Freaks and Geeks and Party Down fame, pro basketball player Luke Bonner and Nikolai Fraiture of The Strokes. Approximately 700 kids and teenagers take part in the DJ Sports Club programs, and on top of competitive and recreational basketball, they offer cooking classes, computer classes, study programs and leadership training. John, the founder and director of DJ Sports Club, said that basketball is used as a kind of bait to get young people involved in the variety of other educational and social programs they offer. But he adds that being a member of a team sport can do a lot for a person’s development. “It’s like society with different classes within a team sport,” John said. 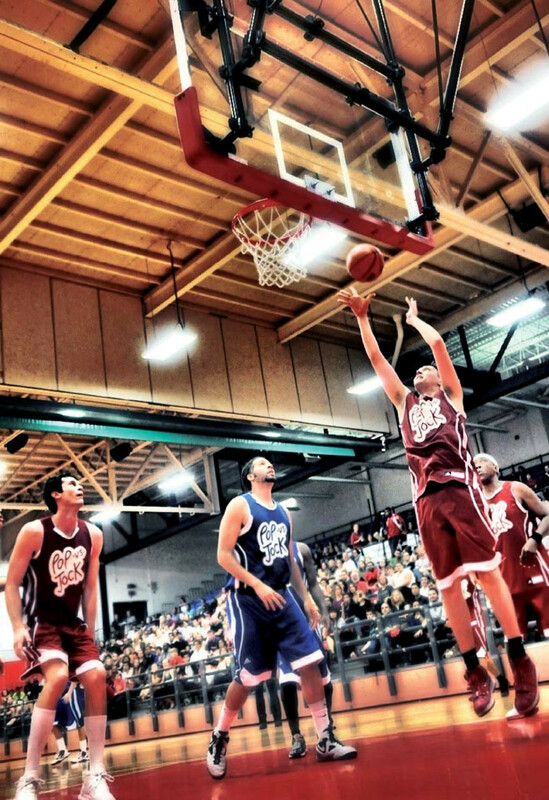 Win Butler’s been in the basketball league for a number of years. And we started talking and he found out that I do stuff with kids and he asked how to help. And we came up with a basketball game. With POP Montreal, it all just came together. John met Butler through the adult basketball leagues he organizes for men and women. John’s connections within the tight-knit Montreal basketball community lead to the involvement of McGill and Concordia. Jeremiah Gordon, who represents McGill athletics, said that John approached them and that getting student athletes interested in participating was easy. But just because the university players might be a little star-struck doesn’t mean they are going to go soft on Team POP.